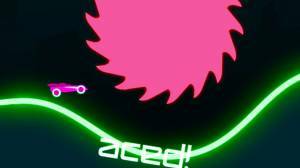 The objective of this addictive free-to-play neon coloured game is to cruise through the never-ending obstacle filled world and either try to score as many points as possible by performing stunts or trying to reach a certain point in the map if you are playing the levels. 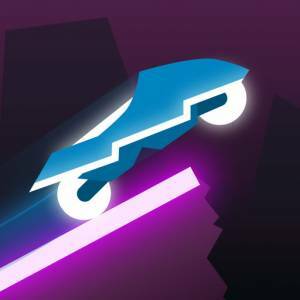 The neon graphics make the game look amazing and the one button control is simple enough to master as it is basically pressing and holding the screen to accelerate and then doing the same when you are in the air to make your vehicle perform a flip to score you points. However, if you land on your back your run ends and you have to start again. In total there are 100 challenges in 32 levels which become progressively harder to complete. There are 10 different themes to unlock and 40 different vehicles to collect (including 4 secrets) such as bikes, cars, tanks, and even skateboards which makes the game fun and interesting. There is also a feature that allows you to compare your highscore with players worldwide. The only real downside to this game is because it is made by Ketchapp they put in a lot of advertising, they do however give you the option to pay real money to remove the adverts.